Thinly slice the potatoes with a knife or with the slicer of your food processor or kitchen grater. Par-boil the potatoes until just al dente, in salted water, (this means bring them up to a boil, and cook for only a minute. This makes the cooking of the tortilla faster and easier). Drain them in plenty of cold water to stop the cooking process. Thinly slice a sweet yellow onion into crescents. Sauté the onion in about a quarter cup of olive oil (trust us, your tortilla will be yummy this way) over a medium heat until they begin to turn translucent. Add the potatoes and stir. 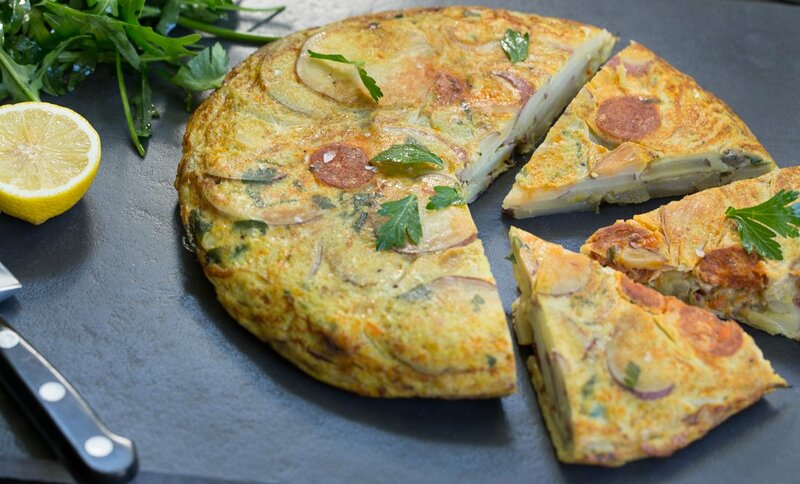 For a delicious Tortilla de Bacalao, evenly distribute slivers of uncooked cod over the top. (You can also use salt cod that you have soaked and flaked). Or what about slivers of roasted red and yellow peppers? Tomatoes? Saffron threads? Yum! But as you tasted in class, even the plain tortilla is just delicious.